The idea of propane-fueled vehicles has existed since the 1970s, and there hundreds of thousands of them in the United States — and millions of them in operation around the world. Not only is the technology proven to work, it has also been approved by the U.S. Environmental Protection Agency (EPA). Propane-fueled vehicles can help companies of all sizes save money, and for many reasons. First, thanks to the U.S. government’s Clean Air Act of 1990, propane is classified as an alternative fuel. As a result, companies that use it may be able to obtain substantial savings through federal tax incentives as well as other governmental programs. While propane will typically cost less than gasoline and has a higher octane rating, it does not deliver the same level of fuel economy. However, not only does the lower cost offset the loss in fuel economy, maintenance costs of propane-fueled vehicles are less as well. Liquid fuels can often lead to problems when cold starting, but those problems do not exist with propane. It is not at all unusual to see propane-powered vehicle fleets last substantially longer than those that use gas — as long as two to three years longer in some instances. Because propane burns a great deal cleaner than gasoline, engines using it do not experience as much carbon buildup. Propane is much better for the environment, emitting as much as 70 percent fewer hydrocarbons as well as up to 40 percent fewer nitrogen oxides when compared to gasoline. 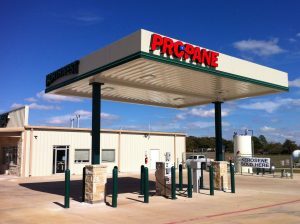 In addition, there are nearly 200 locations that sell propane for vehicles in Texas alone, making it very easy to find a refueling station. The professionals with Northwest Propane have a vast amount of experience in helping companies convert to propane-fueled vehicles. If you would like to learn more about how the process works and how it will help you save a substantial amount of money, contact us online or give us a call at 972-247-6121.